"This is nice," Jonghyun said as he took in his surroundings. It was a Japanese themed noodle house and had good reviews according to a website, though neither of them had ever been inside before. "Just like when I went to Japan." Key nodded. "Do you think they&apos;ll have fish and chips?" Key teased. "With ketchup," he added as a second thought. "I don&apos;t know how you can like that stuff." Jonghyun made a face. "It&apos;s nice! I have to make you try it again." Key laughed. Jonghyun found a table near the back and they were soon ordering their food. "I have to tell you something, Key," Jonghyun said, lowering his voice and turning to look at the floor. Key didn&apos;t say anything, but his smile disappeared from his face. Key knew that something was up; Jonghyun was almost never serious like that unless something important was going on. "What&apos;s up?" 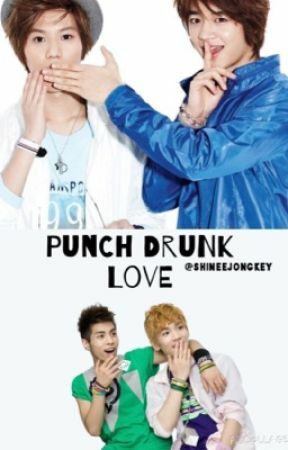 Key said, lifting Jonghyun&apos;s face by pushing his chin up with two fingers. Jonghyun blushed and pushed Key away, trying to make his face expressionless. He couldn&apos;t do it, he felt like he was about to cry - over something so stupid. "Hyunie..." Key whispered, offended even though he knew he shouldn&apos;t be. "Please don&apos;t do this. You can tell me anything." Jonghyun scrunched up his face, trying to push the feelings away instead of Key. He wouldn&apos;t make Key hate him. Jonghyun straightened up. "It&apos;s actually..." he felt Key lean closer as if he was anticipating something, "... nothing." He took a deep breath before looking Key in the eye, smiling. Forcing a smile, anyway. Key frowned momentarily, but he was soon laughing. "You make me worry, Hyunie! I can&apos;t believe you sometimes." He punched his friend in the arm playfully. Jonghyun winced, but not because it hurt or anything, but because he was surprised. Usually Key is seriously nosey when it comes to how his friends are feeling. Key was sort of disappointed, though. He wasn&apos;t entirely sure why. Was he expecting something from hIm? Key knew deep down that he was - of course he was. He was waiting for a full blown confession. About how Jonghyun&apos;s feeling for Key had grown into something stronger, and how he thought Key was feeling the same. Jonghyun forced out a laugh. "Huh, yeah." Key wrapped his arms around his Hyunie and buried his face into his neck. "But please, tell me whatever you want, whenever." Jonghyun nodded at his words, but he knew that Jonghyun probably never would. He could be very secretive when he wanted to be. Their noodles arrived and they ate them in silence, feeling awkward. Why did he have to hide things? Maybe it was Key&apos;s turn to make the first move. They finished their meal and Jonghyun offered to pay. Unsure of how to talk to him anymore, Key just nodded. "Your treat," Jonghyun said and winked. That didn&apos;t go as Jonghyun planned. In fact, he was expecting to be holding Key&apos;s hand, kissing his cheek and openly flirting with him... but they weren&apos;t.
So instead, they payed for the bill and nonchalantly talked about unimportant things on the way back, before heading straight to bed upon their arrival, exhausted from their rehearsal. Some things just don&apos;t go as planned. Minho woke up with his arms wrapped securely around Taemin. He squinted as he looked out the window, seeing the sun blazing down into the room and directly onto where they were both sleeping. "Hmph." Minho groaned, realising that the sunrise obviously meant it was morning, meaning it was rehearsals again soon.